Far up in the northern part of Norway there is a peninsula called Lyngen. 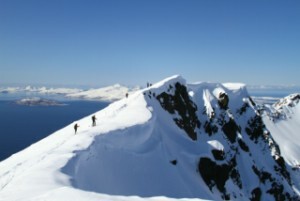 On this peninsula, and on the surrounding islands, beautiful mountains rise up from the ocean and give us great opportunities for ski touring. The view over the fjords is more than spectacular and the shapes of the mountains offer superb back country off-piste skiing. 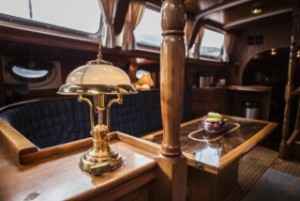 To make this trip an even greater experience we offer you the opportunity to stay on a big sailing boat which takes us around the area between the different ski tours. You cannot get closer to nature and its elements than this. Sailing will take us to the peaks, uphill we will go by muscle power and downhill we will enjoy great skiing. 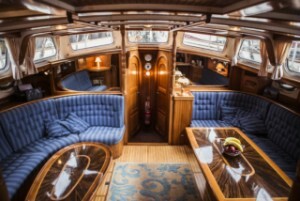 See our web page about the sailing boat in the menu to the right. We take up to 8 guests on this trip. For up to 6 guests we have one mountain guide and if the group is larger, we bring one more guide and divide the guests into 2 groups with 4 skiers in each. This is a standard program that may have to be adjusted due to snow conditions, tide, weather and wind. For groups that book a private week we can run a program from Saturday to Saturday. 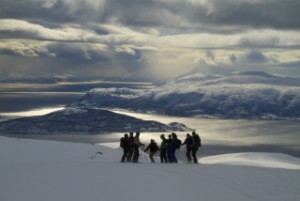 Then we will make a shorter ski tour on Friday and finish in Tromsö on Friday at 2 pm. The last night we stay at hotel in Tromsö before flying home on Saturday. You arrive in Tromsö, we meet and the skipper welcomes us aboard. The boat is in Tromsö harbour and easily accessed by bus transfer from the airport. When all are on-board we leave Tromsö for Vanöya and Arnöya. After 5-6 hours of sailing we will arrive at the harbour where the first night will be spent. Check in on the boat from 4 pm. 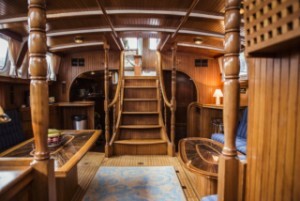 Our first tour day will offer several pleasant, easier tour options on Vanöya and Arnöya (situated side by side). We start off quite easy to get an impression of the group. Today we will make 600-700 meters vertical. When we return from the tour the boat is waiting for us and after a coffee break we will move on to Ulvyöa, about 3-4 hours sailing. In the evenings you have the possibility to go fishing, from the boat or by taking the dinghy for a spin. Today's tour crosses the island Ulvöya. We start from our morning position, hike up the mountain and ski down on the other side. We will arrive in Hamnäs where the boat meets up and we can fill up our provisions. The night will be spent in the harbour. When we wake up in Hanmäs we have several tour options. 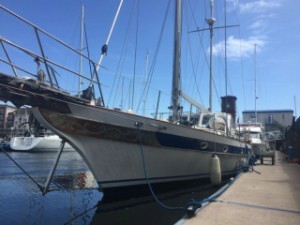 We can go straight up from the harbour, or start the day by sailing two hours to Koppangen. When coming down to the boat we only have 1,5 hour sailing to Lyngseidet where we have dinner and spend the night. Lyngseidet is the biggest society on the peninsula of Lyngen. Today's tour options are Rörnestinden rising 1041 meters above sea level or Kavringtinden 1289 meters vertical. 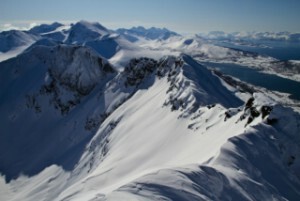 Both peaks give you a wonderful view over the ocean both on the eastern and western side of Lyngen. The afternoon sailing takes us to the northern side of Lyngen where we dock in Norlenangen. Storgalten, "The big pig", despite its name, a beauty rising straight up from the harbour and is our given goal for today. With a vertical of 1219 meters it offers great skiing. In the afternoon we sail to Åldervika. Last tour day for this week. We have the beautiful Ulltind before us, yet another great skiing experience with a sea view. The tour starts in Olderdalen and ends on the other side of the mountain in Snarby where the boat will be waiting for us. Today's sailing will take us back to Tromsö. It is about three hours sailing. The last night will be spent in Tromsö, giving you a chance to explore the city with the most bars per capita in the north, also called "Paris of the North". Time to go home. Check out from boat at 10.00 am. If you like you can extend your trip and stay extra nights in Tromsö. 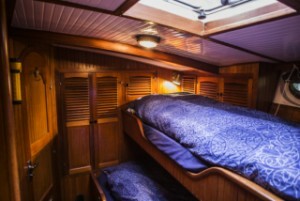 Number of days: 6 days skiing, 7 nights accommodation on the boat.